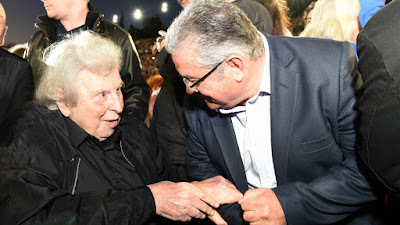 Mikis Theodorakis, 91, conducting his song "Arnisi" (Denial) at the end of an emotional concert at Panathenaic Stadium in Athens. An one-thousand-member choir, numerous musicians, soloists, opera singers, actors and 50,000 spectators paid tribute to Greece's legendary composer. A musical genius, Mikis Theodorakis made a decisive contribution to the cultural renaissance of postwar Greece. His cultural contribution, his music- dressed by the poetry of some of the leading Greek and foreign poets, such as Yannis Ritsos, Odysseus Elytis, Pablo Neruda, Giorgos Seferis- was always entwined with the heroic struggles and concerns of the Greek people. Both in difficult times, during periods of people’s tough fights against fascism, capitalism, imperialist wars and interventions and military coups, as well as in times of upsurge of the people's movement, of endless heroism, the music of Mikis has always been a source of inspiration in the struggle for a better future. Mikis Theodorakis at the concert.